In the medical domain, visualizing the interior of our body is crucial for detecting structures and diseases hidden by our skin. Such visualizations are created by advanced technology like MRI, CT, Ultra Sound (Sonography), which capture fine granular information in millimetre sizes nowadays. As MRI and CT images are cost intensive, Ultra Sound imaging can be performed as a cheaper solution. 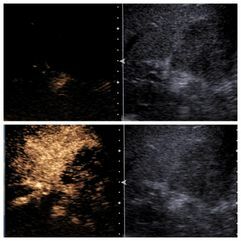 Contrast Enhanced Ultra Sound is a novel technique, which can be used for follow-up diagnostics in a convenient way. The imaging gives the physician insights about the type of tissue, which might by a tumour or not. Prerequisites for working on this topic are advanced knowledge in algorithmic design and good programming skills in either Java or Phython.